Illinois is a fast-growing state for solar, and the industry is growing, too, with over 261 solar companies in the state. In 2014, solar installation investments totaled over $16 million, representing an increase of more than 165% over 2013. 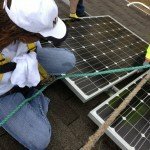 There are plenty of opportunities for a career in solar in Illinois. To find out more about the specifics of solar companies and solar installations in Illinois, please visit the Solar Energy Industry Association’s website, www.seia.org/state-solar-policy and select your state to see more.